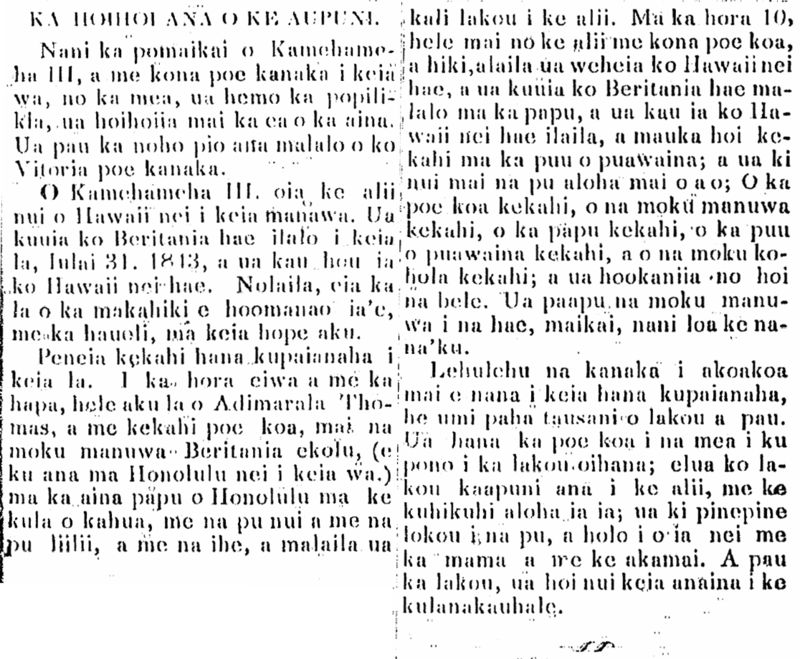 The First Kamehameha Day, 1872. This past Tuesday, as per the Royal Proclamation, the 11th of June was observed as the day to commemorate Kamehameha I, our Royal Ancestor who conquered the land. This is a new day included in the realm of holidays; and the people were joyous at the designating of a day like this for the remembering of our precious beloved one of days gone by. The day opened beautifully, without any drops to bother the people who were well adept to celebrate the day. From early morning, the doors of the large and small shops of town were closed shut, and when the sun came out, nonexistent the sight of many people on the streets of this town, and the places of work were deserted. Everyone was ready to entertain themselves with pleasures of all sorts; some people with feasts or horse riding, but it seemed as if most of the people were at the races set up at Kulaokahua, where enjoyments of all sorts took place [? i muu ai]. The sight of the race track on that day, was as if like no other before. The lanai and tents were nicely built, and congratulations go to those responsible for that distinguished job. The lanai and grounds were filled all the way atop the hills with thousands enjoying themselves with the festivities of the day. Should a visitor stand far away and look forth, it was as if it was a scene from great racing days in Europe. The events of the day began at 10 o’clock or thereafter; and to take in all of the many fun activities of the day was great; there were no big uproars to disturb the peace; that is something unusual for big days like this. At 10 o’clock sharp, Queen Emma made an appearance with her guests, and King Kapuaiwa with his suite. At the arrival of the King, the activities of the day were opened, and all the people joined in the festivities set aside. There are the races below as well as those who won. The activities of the day began with the First Race for the Kamehameha Plate, which was two miles long. John A. Cummins [Keoni Kamaki] of Waimanalo won, with “Carry the News,” with a time of four minutes and thirty seconds. This was one of the fine open races [heihei pualu] of the day. Trotting Race [Heihei Holo Kaa], for one hundred dollars, two mile long course. J. T. Chayter won with the horse Bill Taylor, with a time of seven minutes and thirty seconds. Foot Race [Heihei Kukini], for twenty dollars, two hundred yards, won by E. Williams [Edward Williams]. King’s Cup, won by John A. Cummins [Keoni Kamaki], with his horse, “Carlotta,” one mile and a half, with a time of two minutes and twelve seconds. Sack Race [Heihei Eke], was one of the most humorous races of the day, won by Sam, the harbor boy who is used to winning that type of race in past years. 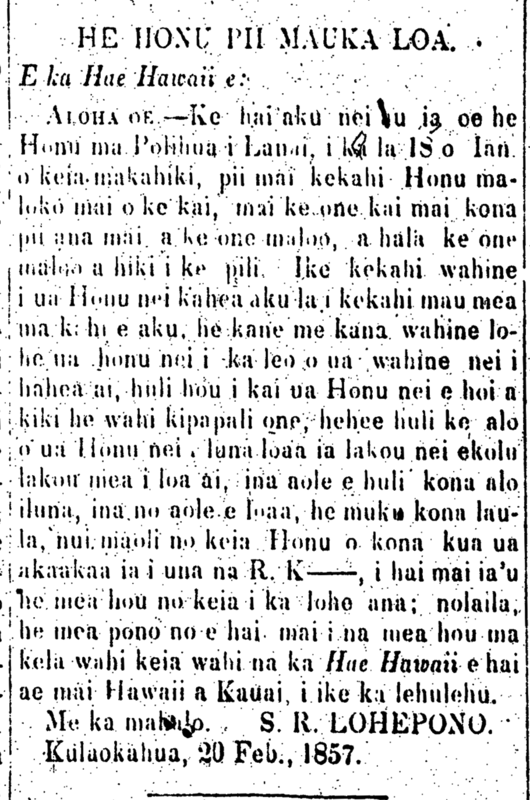 Honolulu Purse [Eke Honolulu nei], of $100, one mile, won by “Bosetona,” the horse of Keoni Miki [John Meek]. Mule Race [Heihei Miula], $40, won by the mule of Mr. Pilipo of Kailua, Koolaupoko. Foot Hurdle Race [Heihei Kukini Lele-pa], four hurdles in a hundred yards; the first place went to Ed. Williams, and the second to Sam; $40 and $10. Public Purse [Eke o ka Lehulehu], one mile, the horse of John A. Cummins [Keoni Kamaki], “Tom Riddle,” won, with a time of two minutes and fourteen seconds. $60 Purse [Heihei Eke $60], half a mile long, between “Carlotta” and “Jack Diamond.” This was one of the best races of the day, in the first running, they were head to head; but on the second race, “Carlotta” won with a time of one minute. Velocipede Race [Heihei Kaa Huila kahi], half a mile long, won by Edward Williams. Hurdle Race [Heihei Lele pa], for $80, won by “Carry the News,” the horse of John A. Cummins [Keoni Kamaki]. Eight hurdles were jumped over in two miles. The final race was the wheelbarrow race [heihei kaa palala], which was the most comical. With this race, the activities of the day came to a close, and everyone went home with hearts filled with much joy. There is one thing amongst all the activities which we appreciate greatly, that is the fraction of various sorts of commotions. There were no disturbances believed to have resulted from the gaiety of the day. Ke Au Okoa, Buke VIII, Helu 9, Aoao 2. Iune 13, 1872. 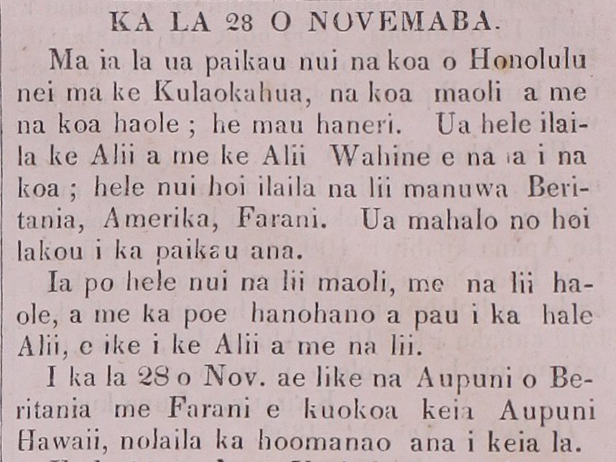 More from Ka Nonanona, August 8, 1843. THE RESTORATION OF THE KINGDOM. How great are the blessings of Kamehameha III and his subjects now, for the difficulties have subsided and the sovereignty of the land has been restored. No more is the living as subjects under the men of Victoria. Kamehameha III is now the monarch of Hawaii nei. The British flag has been taken down on this day, July 31, 1843, and Hawaii’s flag has been raised once more. Therefore, this will be the day of the year that will be commemorated with joy from here forth. Here is an awesome event that happened today. At half past eight, Admiral Thomas went along with some sailors, from the three British ships (anchored at Honolulu now) to the fort of Honolulu at Kulaokahua, with large and small firearms, and spears, and there he awaited the king. At 10 o’clock, the king went with his soldiers, and arrived; the Hawaiian flag was unfurled, the British flag was taken down from the fort, and there the Hawaiian flag was raised, and so too in uplands, on the hill of Puawaina [Punchbowl]; many guns were shot off in salute all over: The soldiers did it, the warships as well, the forts as well, and the hill of Puawaina as well, and the whaling ships as well; and the bells were rung. The warships were festooned with flags; it was a fine and beautiful sight to see. There were many people gathered to witness this amazing event, perhaps there were ten thousand in total. The soldiers carried out their duties well; they circled the king twice, while saluting him; they shot off their guns many times and marched here and there quickly and smartly. And when they were done, the crowd all returned to town. Ka Nonanona, Buke 3, Pepa 6, Aoao 25. Augate 8, 1843. TURTLE THAT TRAVELLED FAR INLAND. Aloha to you:—I am informing you about a Turtle at Polihua, Lanai: on the 18th of January of this month, a Turtle travelled from within the ocean; it went from the wet sands to the dry sands; passed the dry sands until where the pili grass grows. A woman saw this Honu, and called some people who were elsewhere, a man and his wife; the Turtle heard the voice of the woman that was calling out, and it turned back to return to the sea; it came upon a sandy cliff [kipapali one?] and the Honu slid and flipped over; the three got what they were after, but if it had not flipped over they wouldn’t have caught it; it was a muku¹ in width; the Honu was huge; the shell was removed by R. K_____, who said to me that this was something not heard of; so it is important that the Hae Hawaii covers news from all over so that all from Hawaii to Kauai can know. With appreciation, S. R. LOHEPONO. ¹Muku is when you stretch out both arms, the length from the fingertips of one hand to elbow of other arm. Ka Hae Hawaii, Buke 2, Ano Hou.—Helu 1, Aoao 1. Maraki 4, 1857. On that day, the soldiers of Honolulu drilled about Kulaokahua, both Hawaiian and haole soliders, hundreds of them. The King and Queen went and inspected the troops; many of the officers from the British, American, and French warships came. They admired the drilling. On the night, the Hawaiian alii and the haole ones, as well as all of the prestigious people came to the Palace to see the King and the alii. On the 28th of Nov., the nations of Britain and France acknowledged the independence of this Hawaiian Nation, and that is the reason for the celebration on this day. Elele Hawaii, Buke 9, Pepa 19, Aoao 75. Dekemaba 1, 1854.